'Primary Colors' by Nancy Tankersley. Two artists who have a great sense of light and color are exhibiting at the Chadds Ford Gallery, just in time for spring. Jacalyn Beam has a knack for choosing locations to paint, and pieces such as “Kennett Schoolhouse” benefit from her painting the fence in front and the thicket of old trees that partially obscure the brick building. “Walker's Mill” takes an upstream view of the often-painted mill building on the Brandywine in Greenville, Del. grass, with a vivid red barn roof drawing your eye to the center distance. “Beach Path,” on the other hand, is a little slice of pathway between two fences, leading to a band of blue ocean, and it works its magic on a smaller scale. 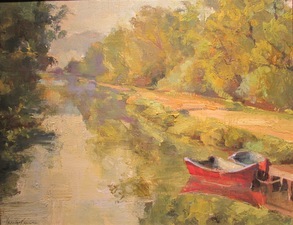 Beam's perfect view of summer warmth, “Canal Boats,” captures placid water, reflected branches and two red rowboats tied to a dock; while “Waiting for Spring 2014” is a winter scene of snow-covered roofs and gray trees, but the bright hues of the buildings are a hint of the spring colors on the way. 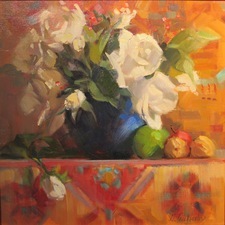 Nancy Tankersley's floral still life, “White Roses,” glows beautifully, just like her other still lifes in this show. Her “Primary Colors” brings together an intriguing collection of vividly colored vases, fruit and other objects, and “A Profusion of Pink” shows a few flowers haphazardly tossed on a table. The painting jumps with well-chosen highlights. Taken as a combination, the works by these two artists are a great way to welcome spring's much-appreciated arrival to our area. The summertime scenes and dynamic blooms are a perfect way to banish winter. The exhibit will continue through April 27 at the Chadds Ford Gallery (1609 Baltimore Pike, Chadds Ford). Hours are Tuesday through Saturday from 10 a.m. to 5 p.m., and Sunday from noon to 5 p.m. For more information, visit www.awyethgallery.com, or call 610-388-2412.